I love all of London so choosing a favourite part is very difficult. I do love however that London has so many parks, some small and some very large. You can feel as though you are in the countryside right in the centre of this huge city. Walking along the canal tow paths is something I love when feeling a little stressed. The canal boats chug along showing a very slow pace of life. A wonderful varied bird life. Then I chat to the fishermen, some days they have extraordinary catches other days nothing. As they tell me its not for the fish but to relax. 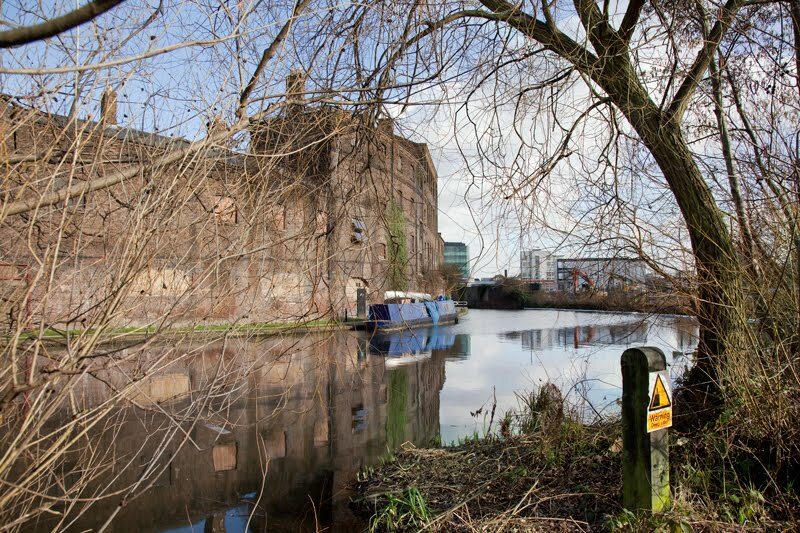 This picture of Regent's canal is taken from the banks of the nature reserve, which will soon be teeming with wildlife. Take a look at other CDP's walk through their favourite spots of town. I would love to take a trip along the canel. All stress gone. so pretty, love the reflections in the water too! yes, it seems to be a very peacefull place ! I have some wonderful memories of watching the canal boats floating silently along the canals and working the locks as they move along. Wonderful choice. What a wonderful glimpse into your London. Thanks. Now I REALLY want to visit London! Beautiful picture and description. Delightful:-) There's something very calming about canals. I love canals. About 15 years back, my brother in law worked on the Regents Canal as a lock keeper/maintenance man. He drove one of the dredgers and was responsible for keeping his stretch in good order. They lived in one of the lock keepers cottages. your descriptive text is perfect! Lovely part of London. I often walk along the river here where I live and what i like most is the sound of silence. Just birds and the odd insects. Ciao. A. It looks wonderful, but there is a sign of warning for danger. Great shot - I'll have to check out this area when next in London! This is a lovely shot of a lovely place! I know how you feel about walking along a the water, we have a lot of waterfront trails in Montreal as well and I love them! It would be hard picking a favorite part of town in a city as big and grand as London. A quiet canal area is an unexpected but very good choice.